Which way would the Lib Dems go? Our model now gives a 7% chance that the Conservatives will be the largest party but could only form a majority with the support of all of the Lib Dems, the DUP and UKIP. But the Lib Dems would also be able to form a majority with Labour and the SNP. 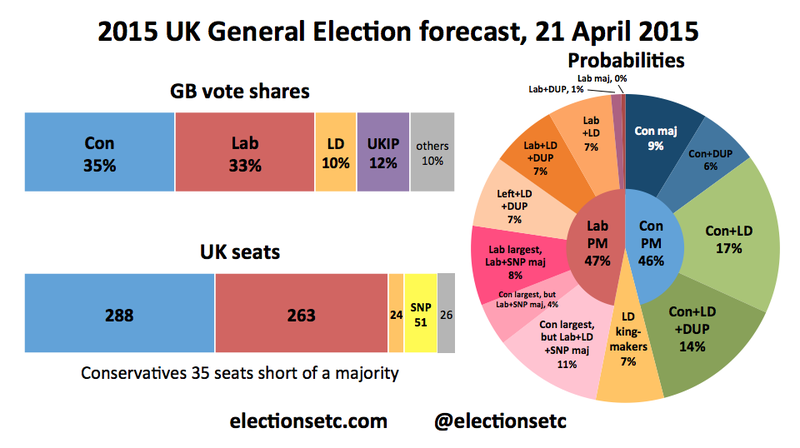 In our central forecast, the Tory-led group would have 325 seats while the Labour-led group would have 338. We had previously assumed a four-way deal for a very slim majority involving both the Lib Dems and UKIP very unlikely, and that this scenario would therefore result in a Labour-led government supported by the Lib Dems and the SNP. However, the Lib Dems are keeping their options open. They’ve refused to rule out a deal involving an EU referendum – UKIP’s key demand – and have suggested they’d give first refusal to the largest party (in this case the Conservatives), while saying they might still be willing to work with the second largest (Labour). We are therefore now designating this outcome the “Lib Dem kingmakers” scenario. So our model now points to a 47% chance of a Labour-led government, a 46% chance of a Tory-led one, and a 7% chance it’d depend which way the Lib Dems go. A Labour-led grouping of Labour+SNP+LD would have 338. (Plus 4 PC, 1 SDLP and 1 Green …) That’s a six-party agglomeration. One boggles at the logistical and whipping complexities…. Massive typo in line one – surely 70% not 7% probability that Conservatives the largest party? No – the 7% is for the specific scenario (my caps) ” that the Conservatives will be the largest party BUT could only form a majority with the support of all of the Lib Dems, the DUP and UKIP”. lib Dem party faithful get and how much the leaders?